What do you do when you friend gives you a bag of cacao nibs? You rack your brain trying to remember a a chocolate-rye crumb cake that incorporated them? Well, that’s what I do! I knew I came across this chocolate-rye crumb cake. The problem was trying to remember in which of dozens of magazines it was in? I knew it was around here somewhere and it just was a matter of checking my different magazine files. I have made it a goal this year to organize better my different magazines. Every month or so, my husband and daughter remind me that it is time to say goodbye to a few. A few? How do you choose which of your beloved cooking magazines to give away? It really doesn’t seem fair! It’s truly the only vice I have. Well, that and collecting cookbooks. I did purge the cookbooks at the end of last year. I came home one day to find they betrayed me. My cookbook therapists took all the books off of all the shelves and had them in piles. The piles snaked around the circumference of our dining room table and trickled out into the living room. I had to hop over one part of the pile to the other to get to the core of the bookshelves and see what they were really doing with my beloved books. They had some also in boxes and I think I shed a tear or two. they promised me they weren’t taking any thing away until I decided to part with something. But it was very convenient that they already started the packing process. They knew it was something I wouldn’t be able to accomplish without their subtle push (or rather, shove!). With the process already started, it was time to honestly assess my feelings for book after book that I was sure I couldn’t live without. I set aside some for a few special friends (that I still need to ship off!!! Another goal to accomplish this coming week). It really wasn’t as bad as I thought it would be. Once the process was started and I had a chance to compose myself, I realized that some of the books were really not a part of my life. Maybe at one point I thought they would be, but if I haven’t even cracked open its pages in years and even attempted one recipe, it may have been just an impulse purchase, and it was time to say good bye. Cacao nibs are perfect to use in baking, to add to granola. You could grind a bit and add it to your smoothie. I know those that eat them right out of the bag. For my taste, it’s a little too bitter to eat right out of the bag, but maybe it’s an acquired taste! I happened to have rye flour. It’s my new favorite flour that I like to sneak into different breads. And yes, even cakes! 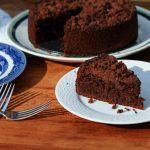 In a cake that is full of chocolate cake such as this one, it’s hard to tell that you added a little rye flour to the batter. As for the cacao nibs in the topping, I think you should be brave and give them a try! They sell them on Amazon (of course)and even Wal-Mart! I was actually out of Greek yogurt and I subbed in some creme fraiche that my mom got at Trader Joe’s. The cake was super moist and and decadent. I think you will get similar results using the Greek yogurt. I had every intention of sharing this before Valentine’s Day to give you a cool and different cake to make for your sweet heart. But guess what? 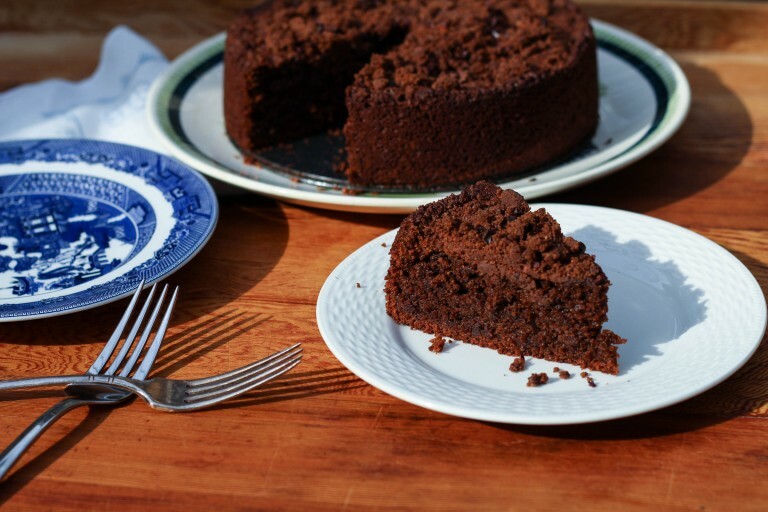 Surprise them this week and bake this wonderful cake! 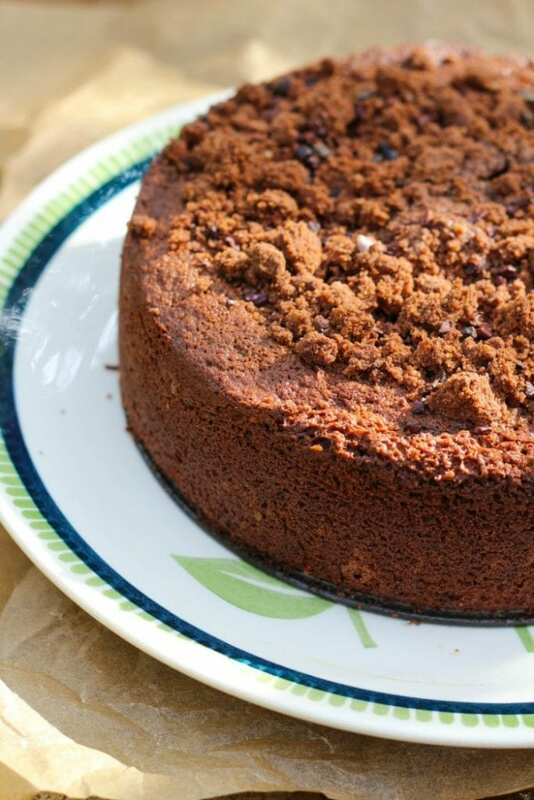 Chocolate-Rye Crumb Cake is super moist made with Greek yogurt. 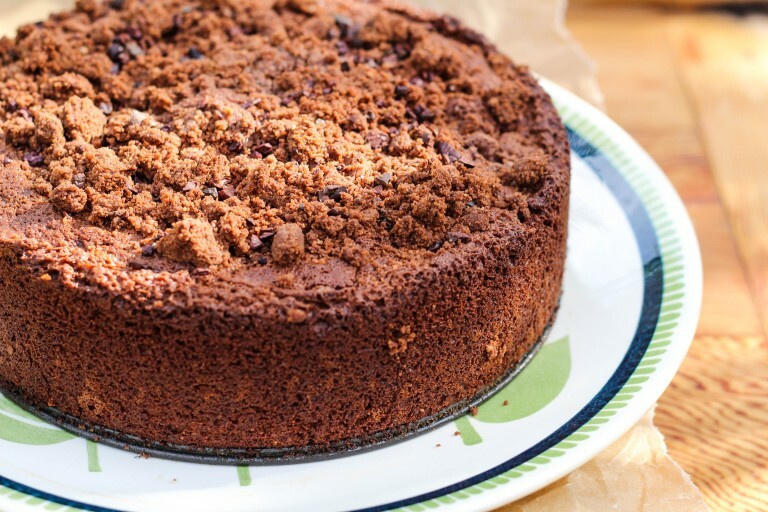 It has a lovely crumble topping that all the chocolate lovers will love that is made with cacao nibs. In a medium bowl, stir together the sugar, all-purpose flour, rye flour, cacao nibs, cocoa powder. Add the butter pieces in and work together with your fingers until large clumps form. Make sure there are no dry spots. You could add a drop or two of vegetable oil if you find the mixture isn’t clumping; cover and chill. Preheat oven to 350°. Coat a 9”-diameter cake pan with nonstick spray and line with a parchment round. In a small bowl, whisk together the all-purpose flour, rye flour, cocoa powder, baking powder, baking soda, and salt in a medium bowl. In the bowl of a stand mixer (or in a medium sized bowl with a hand mixer), beat on medium speed the butter, sugar, brown sugar until light and fluffy. Be sure to stop the mixture and scrape the sides of the bowl. Add the eggs and vanilla; mix about 2 minutes until blended. Lower speed and add in half of the dry ingredients. Mix in the buttermilk and mix well. Add in the rest of the dry ingredients and the yogurt. Mix well, stopping the mixer to scrape the sides of the mixing bowl and incorporate the ingredients very well. Scrape into prepared pan. Toss on the crumbles. Place cake on middle rack of oven. Rotate the cake halfway during baking. I usually lower my oven at the halfway point to 325 F (every oven is different…you may need to keep yours at 350 F during the entire baking time). Bake until the cake starts to pull away from sides of pan and a tester inserted into the center comes out clean, about 50-60 minutes. Let cake cool in pan on a wire rack before turning out.